Winner at the NCCPE Engage Awards 2016 in the STEM category. SMASHfestUK is a free festival organised in partnership between Middlesex University and the University of Greenwich and mainly taking place in Deptford, London each year in February. The event is part of an ongoing engaged research initiative which aims to re-ignite the interest of young people aged between 7 and 17 in science and each event uses as its premise an impending natural disaster which eventually engulfs the community in which the festival is staged. Featuring comedy and variety shows, interactive installations, music, film, participatory art and engineering, experiments and theatre, it explores science, technology, engineering and maths through design and the arts. Operating in partnership with local venues, the festival specifically targets those who are under-represented in STEM, such as economically disadvantaged young people, women, girls and those from BAME communities. The festival, which has so far reached around 30,000 children, is held each year in February. The overarching aim of the project is to widen participation and increase diversity in STEM through the arts. There remains a longer-term ambition to open SMASHfestUK to wider audiences in locations where participation among under-represented groups is similarly limited, but in the short term the project will continue to be located in Deptford, London, in diverse (70% BME) communities with children with multiple indicators of poverty (>50%). The project’s objective is to re-engage younger people by using immersive and interactive activities linked to a tangible overall scenario of an imminent natural disaster and then building science, technology, engineering and maths into activities that explore strategies for survival and rebuilding in the aftermath. The vision of the project team behind SMASHfestUK is a world in which everyone holds the power to employ science and creativity for the good of humanity. The challenge is a declining number of children taking up STEM subjects at GCSE and A Level and, consequently, beyond. There is particularly low take up of STEM subjects among younger children, and especially among girls and young women and those in black and minority ethnic communities. The project aims to understand and break down barriers in order to allow these groups and other young people to access participation, progression and retention in science, technology, design, mathematics, medicine, arts and engineering. A key approach to achieving this aim is to work with communities, education, artists and scientists and partnering with industry and institutions. SMASHfestUK is a hyperlocal festival. Its current location in South East London is a community which faces multiple barriers to equality. The demographic of Deptford’s young people is mostly BAME, and most young people have multiple indicators for poverty. The immediately local schools have a very high proportion of free school meals and 1 in 4 adults is on a very low wage. The project’s audience is mostly young people and their families and through our interactive events the team aim to engage in a dialogic way. 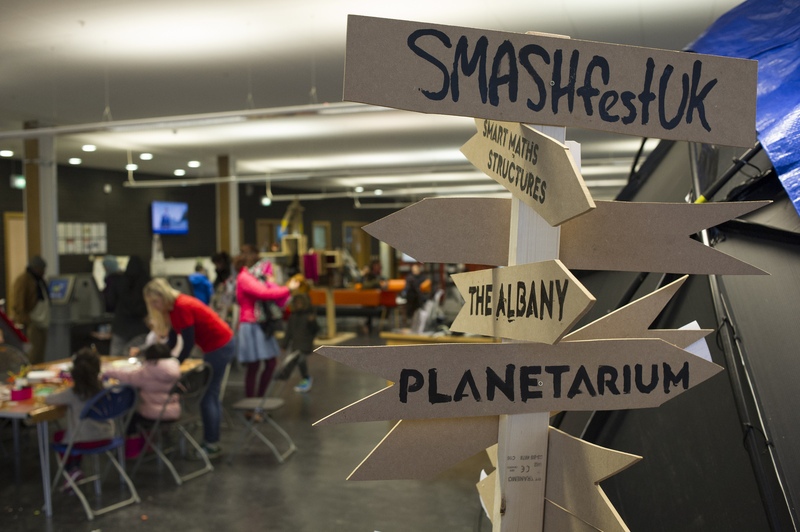 SMASHfestUK is an anarchic, chaotic interactive science festival which uses a narrative-driven and inquiry-led model of engagement to attract a local young audience. Each year SMASHfestUK is driven by a disaster scenario (impending asteroid collision, massive solar storm, supervolcanic eruption) and all festival activities, which include theatre plays, auditorium cabaret and variety shows, interactive science experiments and demonstrations, astronomy, comedy, art and games are linked to the overall narrative theme. SMASHfestUK takes a hyperlocal and inclusive approach so everything is always free of charge, and a deliberate decision was taken to refrain from branding it publicly as a science festival as the aim is to breakdown barriers to inclusion, and both cost, and the science label are known as such (Aspires Study, KCL, 2014). The festival uses broad brushtrokes to engage the public with research. Being mainstream and entertainment-focused allows the project to maximise the impact and audience figures as much as possible. The theme of the festival in any given year is what dictates the science used to engage the public. In 2015 and 2016 the festival themes were a solar storm and asteroid collision respectively and the natural partner for the event was the Royal Observatory Greenwich (ROG). The researchers also replicated a ROG exhibition about the history of asteroid research globally and this was exhibited in the Deptford Lounge and supported by Public Astronomer Dr Marek Kukula. Dr Andy Bardill from Middlesex University explored technological interventions in public engagement, along with Wyn Griffiths from the Product Design and Engineering Mathematics Department. Dr Miho Janvier from University of Dundee also brought her research to SMASHfestUK which included a virtual reality tour of a solar storm. 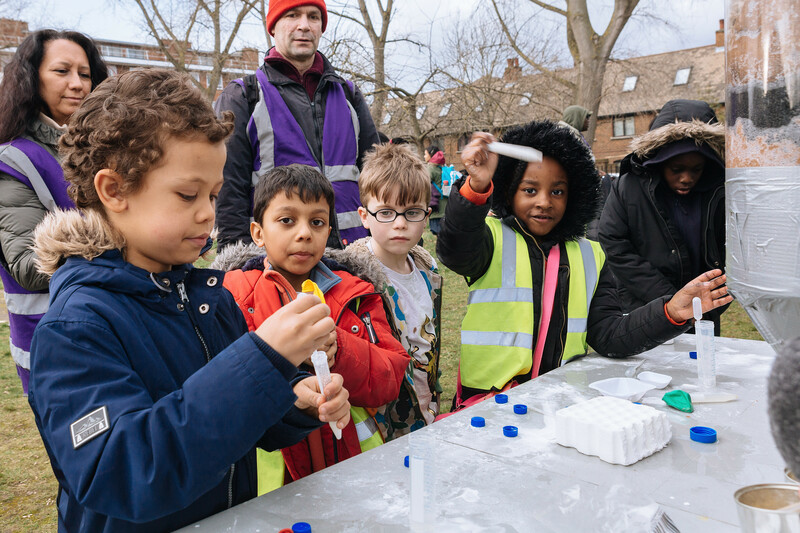 By looking at what was likely to engage and by also researching other events elsewhere - both science and non-science festivals - that delivered effective and impactful outreach, the SMASHfestUK project team was able to develop an engagement model that was well-placed to be successful. The project team also investigarted immersive theatrical approaches, including "Deadinburgh" and the work of Andy Franzkowiak by the Last Theatre. Combining those elements which were thought to be most likely to work for the intended audience, the team identified an approach of semi-immersive activities which remained strongly narrative and theme based. Inevitably as a festival, SMASHfestUK has many collaborators and the festival prioritisies collaborative working in order to develop its component events in a way that most reflects the perceived interests of the audience. Ideas are worked through in development workshops and multiple community groups and organisations are invited to contribute to the development process. As an example of the project’s emphasis on collaboration, the Young People's Panel involved in the 2015 event decided they wanted a zombie element to the festival. Rather then denying this as unscientific, the project created and then interwove a story about people developing zombie-like symptoms after water was contaminated by meteorite material. This resulted in a participatory zombie movie featuring the real Mayor of Lewisham. Evaluation was carried out at the festival by developing a questionnaire which could be completed on paper, in person, on a tablet at the festival or via email afterwards. These questions were independently assessed by a data analyst. Cultural development agency Sam Culture also carried out in depth qualitative interviews with stakeholders and visitors and has written this up as an independent evaluation report. Tickets and box-office procedures (even if tickets are free) are a barrier to engagement. For the 2016 event 20% of all tickets were not bookable in advance and were given out on the street or at the door with no box office interaction necessary. The audience for the two venues were quite different despite being open public spaces only 80 metres apart, with the former being demographically more ABC1 and the latter C2DE. In 2016 the organisers worked hard to seed new audiences from one venue into the other by giving out tickets there. Teenagers and older children/young adults are a difficult audience to attract. The event was successful in attracting young children with their families but less so older children. As a result, instead of trying to attract older children/young adults as audience, project organisers developed a Young Science Explainers programme which involved recruiting older children/young adults from local schools and sixth form colleges. They were trained in safeguarding, public engagement and facilitating workshops and then came onboard as volunteers for the festival and helped run various activities. Having now delivered SMASHfestUK for a third year, grant funding has allowed the organisers, for the first time, to hold elements of SMASHfestUK (the Survival Village) in locations other than Deptford. It is hoped that this will prove a good test-bed for beginning to look at how SMASHfestUK might be rolled out to other locations, possibly in conjunction with other higher education institutions. There are now production “bibles” for the SMASHfestUK projects (Asteroid and Solar Storm) which could be the basis on which other higher education instutitions run their own versions of SMASHfestUK in other locations. However it is also clear that the “hyperlocal” approach requires partnership building with local communities, so any roll-out would involve an evolution of the SMASHfestUK model in a different location – not the imposition of an existing model which may not work in a different location. Involving the community in the development of SMASHfestUK events has always been key to their success and this would have to be replicated anywhere that SMASHfestUK went. For further information, please visit the SMASHfestUK website or listen to our interview with the project team.